Emily's the knitter, Clare's the spinner, and we both like cocktails! Barb and I agreed to do the knitalong for Roxanne Mystery Shawl by Feministy and I decided to do it in Fleece artist sea wool, which I'd bought from Purlescence, in the colour 'earth'. It meant I was a bit short on yardage, but I just felt it would work. The blocking wasn't ideal - did it in this 'log cabin' in Scotland we stayed in for a week around Clare's Etape Caledonia bike race (81 miles in highland Perthshire). It was LOVELY! We had a hot tub on the balcony to sit in and toast the race afterwards (and perhaps get just a little - um - tired and emotional). Anyway, so the stripy towel - not so good for the pics! 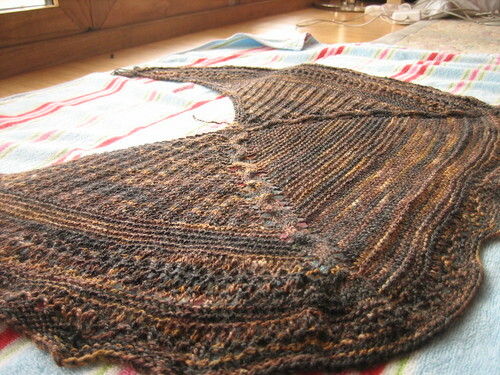 We did a lot of driving and I cast on for another shawl - this time Taygete, by Romi. 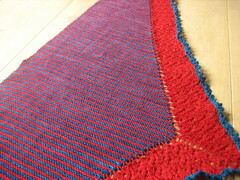 I'd thought I might, and so had yarn for it with me - the remains of the red Colinette Jitterbug I had from the millshop and used for Audrey in Unst, and some deep teal in the same. I'm really pleased with it! 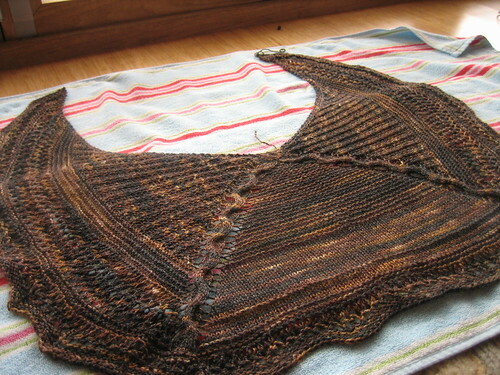 And the WIP - well I only have pics of Clare's element - the spinning. It's yarn from her Spintelligence spinning club. 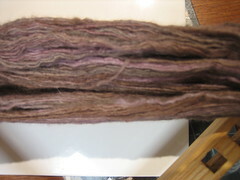 The fibre came from Picperfic and is 50% 18.5micron superfine merino, 30% cashmere and 20% silk - so soft! 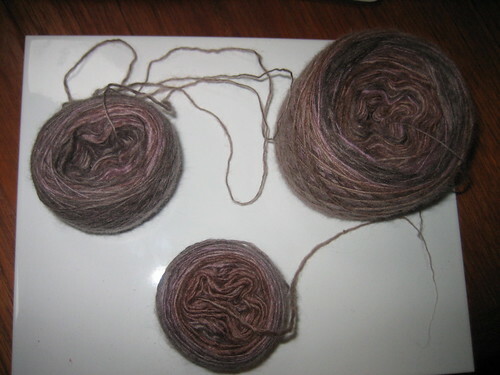 Minniemoll has pics of her fibre and what she spun here for those of you on Ravelry. 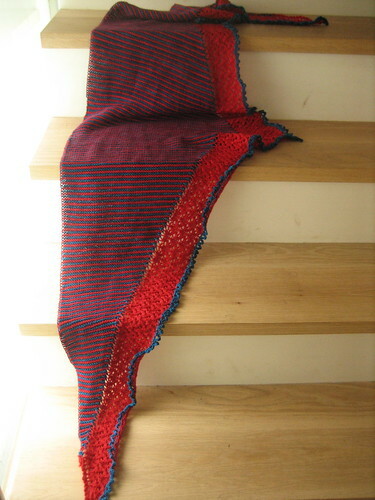 I'm using it for another of Romi's 7 small Shawls - Maia. 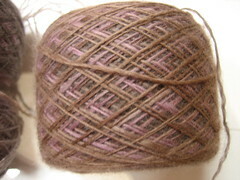 This yarn is much lighter weight, a laceweight single. I think it'll work out really well. Love the knitting (of course), but I had to comment about the yarn - Clare's spinning is so wonderfully fine and even! What an inspiration. Is there anything you two cannot do? Totally agree with Lara. Amazing knitting and spinning. 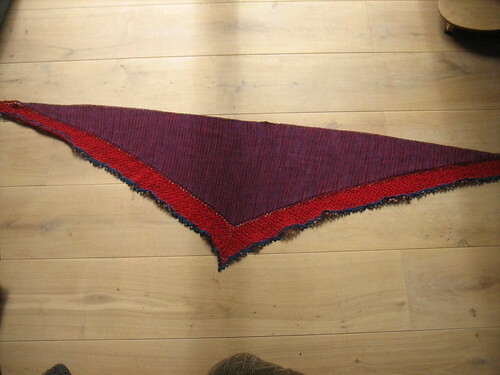 I've always wanted to try a shawl shaped like the top one but have always been afraid of the blocking process, especially now that I have wood floors. Yours is stunning. Actually, they are both stunning! The shawls are fantastic! Love the Fleece Artist. I wish I was back in Scotland!